Jaishree checks a newborn’s temperature. 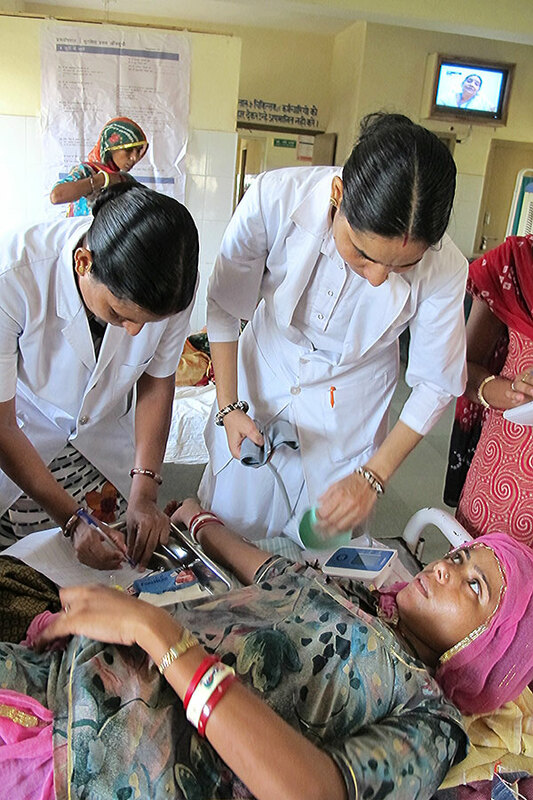 Churu, India–When veteran nurse Jaishree Darjee was invited to a Jhpiego-led training to strengthen maternal and newborn care, she was hesitant about going. Her absence from Bharatiya Hospital would surely burden an already understaffed maternal and newborn care unit, where nearly 7,000 births occur annually. But, Jaishree’s desire to strengthen her maternal care skills outweighed her initial reluctance. She joined other newly appointed nurses in a capacity-building program with a focus on incorporating the Safe Childbirth Checklist (SCC) into their practice. “The things I learned during the training are very relevant. [They] are like a safety shield for the mother and infant,” Jaishree says. Bharatiya Hospital is located in a region that many call the gateway to the Great Indian Desert. Extreme weather conditions, difficult terrain, low literacy levels and a largely rural population are hallmarks of the region, and the nearest medical college where referrals can be sent is more than 100 miles away. Jhpiego, with support from the Children’s Investment Fund Foundation and in partnership with the Government of Rajasthan, has been working at Bharatiya Hospital and other facilities across seven districts of Rajasthan since 2012 to strengthen the quality of care through a program using the SCC. This simple tool helps health care providers adhere to safe care practices during and immediately after childbirth. The checklist targets major causes of maternal and newborn deaths, such as postpartum hemorrhage, infection, hypertensive disorders and, in newborns, asphyxia. If Jaishree was reluctant before the training, she was inspired—and more skilled—after it. Alongside her fellow nurses, Jaishree learned how to use the checklist properly and the benefits expected from it. Ultimately, she gained skills and confidence in managing complications. Jaishree and another nurse performing an examination on a mother. Jaishree has become an advocate for the program, and has worked to ensure that the use of the checklist is institutionalized throughout her facility. Under her guidance, health care providers at Bharatiya Hospital closely observe every mother and newborn, recording vital information from temperature to blood pressure, and keeping an eye out for danger signs like vomiting or abdominal pain. Now, Jaishree says, “we don’t panic with helplessness.” And the checklist can help avert other problems. In one case, Jaishree was performing a final check on a mother and spotted a warning sign. “When I took this mother’s temperature, it was above 40 degrees centigrade. So I decided not to discharge her straight away, but first consult the doctor,” Jaishree recalls. Together, they quickly diagnosed and treated a case of puerperal fever, saving the mother from further complications. Bharatiya Hospital remains busy, with a high number of cases and crowded wards, but the Safe Childbirth Checklist has empowered Jaishree and her fellow nurses to detect complications on time, provide the first line of treatment and prevent the needless deaths of mothers and their newborns.